Beautiful tri-Level home in "Heritage Villas" w/attached 2 car gar! Home features panoramic views of mountains, hills & creek and views from all rooms are private and serene. Granite kitchen counter tops, huge pantry, open flr plan & neutral decor. Dining rm & family rm are just off kitchen and feature fireplace and view to lovely landscaped palm trees. Master suite has lg walk-in closet & view. Central A/C & heat, community pool/hot tub.Award winning Poway School District! SEE SUPPLEMENT FOR MUCH MORE Welcome home to a highly sought after "Heritage Villas" in Sabre Spring! When you are looking for something special, look no further than this property in the beautiful community of Sabre Springs! Nestles in 880 acres of preserved open space of Chicarita Creen offering a beautiful view of mountains, hills, and water flowing creek. It is energy-efficient, and reduces your impact on the environment while allowing you to live in comfort and style. 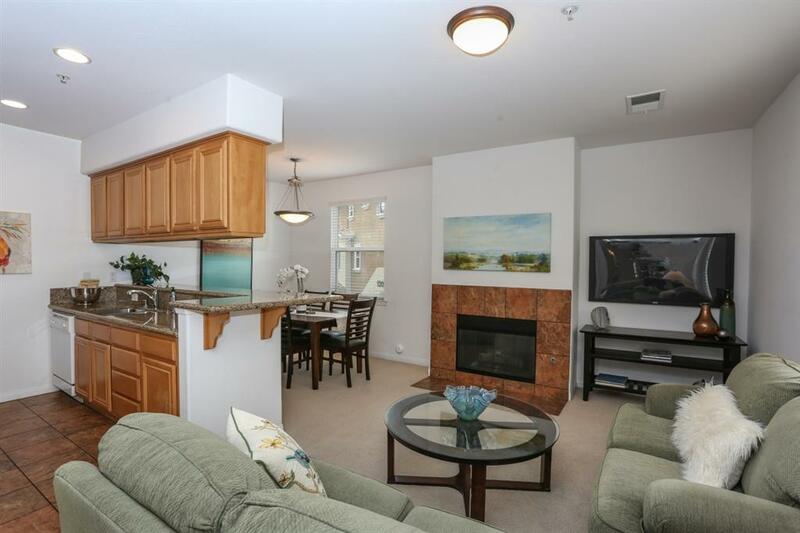 This 2005 condo hoe promotes health and wellness through use of non-toxic materials (Benjamin Moore paint), your neighborhood is strategically closer to everything loved. This means less driving, less stress and pedestrian-friendly access to key neighborhood resources. 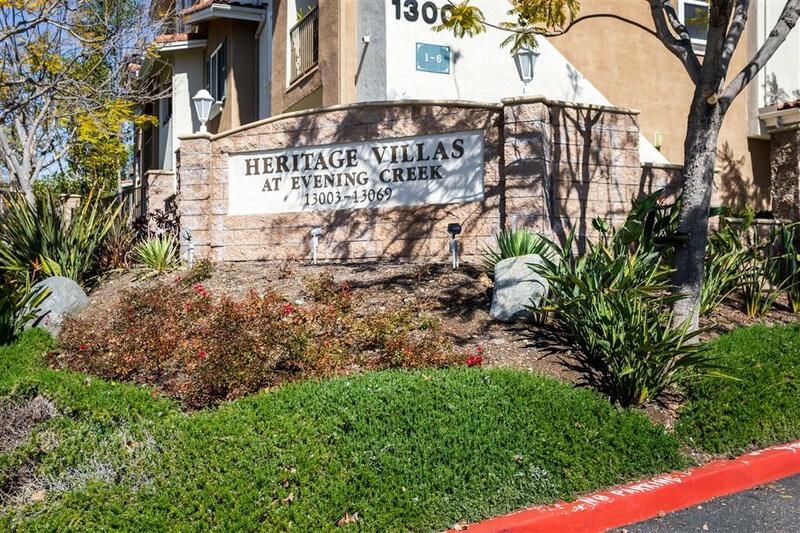 This resort-like, gorgeous 3 level condo home has view of serene Chicarita Creek, walking distance to Morning Creek Elementary School, walking distance to Sabre Springs Park, shopping, dining, Rancho Bernardo & Scripps Business Park and MCAS Miramar. This 3 bedroom, 2.5 bathroom, 1447 square feet home offers open floor plan, living room and dining room, very short walking distance to community pool and hot tub. This prime location offers easy access to I-15 and 56. 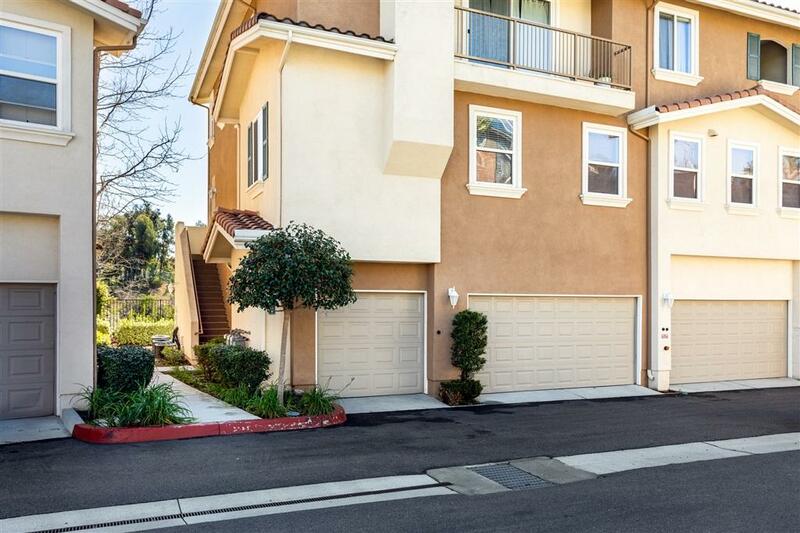 It is in the Award Winning Poway School District, and also offers an attached 2 car garage with direct-interior-access, transmitter, and 3 bedrooms with beautiful views from each of the bedrooms, including the master bedroom closet window! 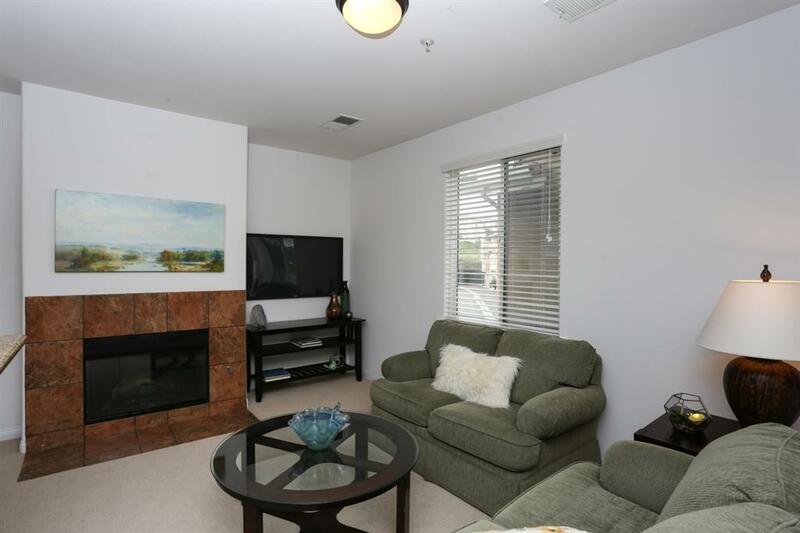 The living area features an elegant dual-sided fireplace with beautiful new custom made Faux wood blinds throughout, which are appealing from the front door. The kitchen has stainless steel appliances, natural oak cabinets, gorgeous granite counter tops, and a built in new GE microwave and new stainless steel Frigidaire refrigerator. The master bedroom has beautiful walk in closet with window view and is retreat-like, and also has direct access to a balcony. The beautiful neutral color carpeted floors complete this home to make it cozy. There is a private washer and dryer closet on the bedroom level, which make the laundry chores much easier. All GE appliances are included. Homeowners enjoy the the beautiful club house for private functions along with the pool, hot tub, and BBQ. Come see this wonderful property in order to appreciate all it has to offer! Listing provided courtesy of Chase Pacific. Listing information © 2019 San Diego MLS, Inc.